The display is 17.3-inch HD+ or FullHD EWV LED Backlight and there’s also the opportunity to use a FullHD 3D LED Backlight display.These are powered by Intel’s Core i7-3720QM processor @2.6 GHz which sits on Intel’s own HM77 chipset and comes with integrated 650 MHz Intel HD 4000 GPU. The processor is capable of overclocking @3.6 GHz in single core use, 3.5GHz in dual-core use and 3.4GHz when three / four cores work at 100%. The G75VW and G55VW uses 6 MB of L3 cache and uses HyperThreading technology so the CPU can manipulate eight threads at once if needed. Gamers can opt for a GeForce GTX 660M or 670M graphics card with either 2 GB or 3 GB of GDDR5 memory. The memory can go up to 16 GB in dual-channel mode. Asus’s Republic of Gamers G75VW and G55VW gaming laptops were among the first laptops to offer Nvidia Kepler graphics, with the GeForce GT 660M card. Other features of ASUS G75VW and ASUS G55VW includes 750 GB of storage, SSD drives and RAID 0 and 1, an 8-cell 5200 mAh battery. The laptops weighs 9.9 pounds. ASUS also offers the cheaper i7-3610QM processor for these laptops. The 17-inch 3D-capable Asus G75 is available for $1499.99 online @ Amazon and is configured with 16GB of RAM and a 750GB hard drive (7200 rpm). Shipping should take just over a week. 15.6-inch G55 can be purchased from online @ J&R for $1449. 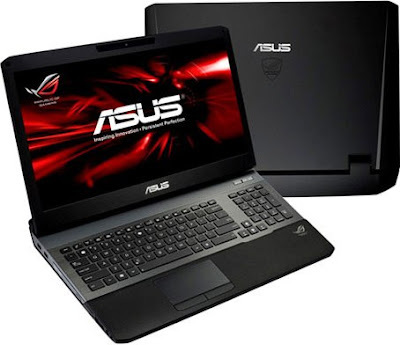 Tags:Asus’s Republic of Gamers, ASUS G75VW, ASUS G55VW, ASUS G75VW features , ASUS G55VW features, ASUS G75VW availability, ASUS G55VW availability, ASUS G75VW price, ASUS G55VW price, ASUS G75VW details, ASUS G55VW details, ASUS G75VW specs, ASUS G55VW specs.